Pork chops are one of the easiest and quickest week night dinner options, not to mention one of the most inexpensive meats on the market. I used to avoid eating pork, except for bacon (because I’m a bacon addict), just for the sheer fact that pigs will eat anything (and I mean anything) you feed them. However, I have come to terms with the fact that I love pork, and it can provide an inexpensive way to get more protein in your diet. And since I’m on a budget, pork was on my grocery list this week. My best friend brought over some left-over pineapple chunks from a conference he attended over the weekend. And I don’t mean, just a few chunks but an entire “to-go box” full of pineapple. So I have a lot of pineapple to use up. 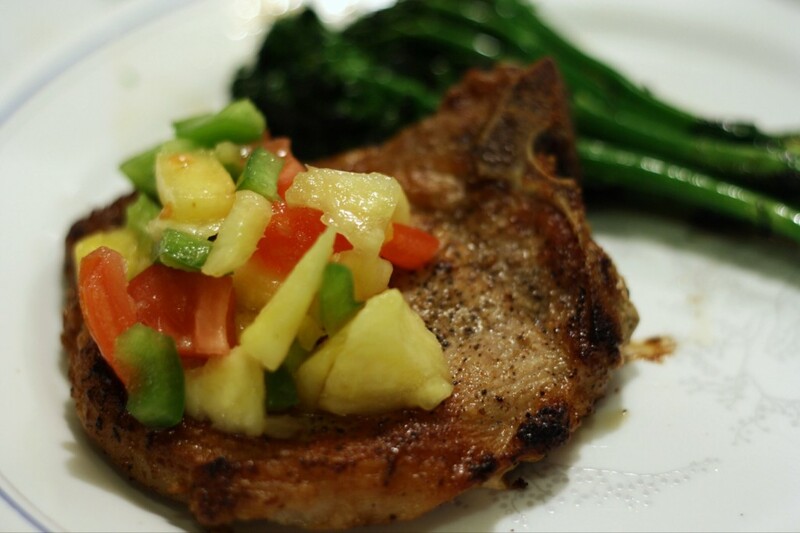 Pork and and pineapples go together splendidly, and what better way to use up the extra bell peppers in my fridge than with a delicious medley of pineapple salsa? For the pineapple salsa, I used what was left in my fridge of fresh vegetables – tomatoes, green and yellow bell peppers. If you have cilantro, feel free to use it. For my side dish, I sautéed fresh broccolini using the pork fat in the pan I cooked the pork chops in. I sprinkled salt, pepper, and garlic salt on top,of the broccolini and stir fried it until cooked, about five minutes.